Take a look at the Rotunda clock and you may notice something unusual. The face uses “IIII” to represent 4 o’clock on the dial. Bob Desrochers, a master clockmaker who consulted with the University on new clocks for the Rotunda, said “IIII” is, in fact, customary. 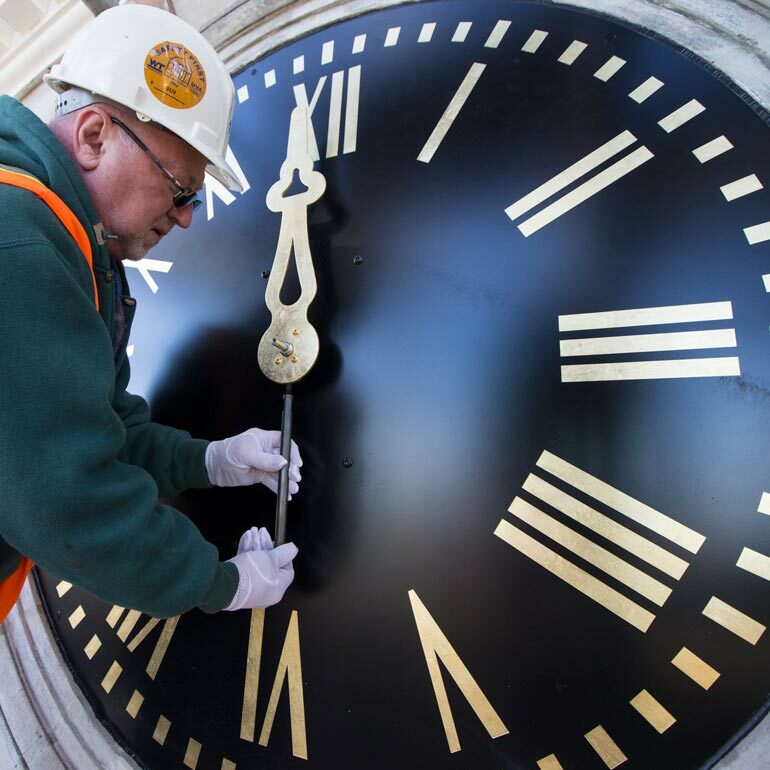 Workers completely replaced the clocks in the north and south porticos during the renovation: new clockworks, new hands and new dials (or faces). The old iron dials remain in place, encapsulated and protected by the new, aluminum dials that are painted black with gilded numerals (including IIII) to resemble the 1890s dials, says Mark Kutney, an architectural conservator in the Office of the Architect for the University. The original Rotunda clock was made by Boston clockmaker Simon Willard. Measuring 60 inches across the dial face with a 10-inch bezel (80 inches in all), the clock dominated the pediment of the south portico. A clock wasn’t added to the north side of the Rotunda until the Annex was built in the early 1850s. The Willard clock perished in the 1895 Rotunda fire, and when Stanford White re-envisioned the Rotunda, he commissioned for the porticoes two slightly smaller clocks—each with a 55-inch dial face and a 5 ½-inch bezel—from another Boston clockmaker, E. Howard and Co. Various changes were made to the Howard clocks over time; their pierced, ornate hands were replaced with plain wooden hands, and the mechanisms were changed and updated as technology advanced. The new clockworks provide automatic seasonal time changes and time resetting after a power failure, among other features. Every part of the old clocks will remain on Grounds and preserved, either in an archive maintained by the Office of the Architect or in the Rotunda building. 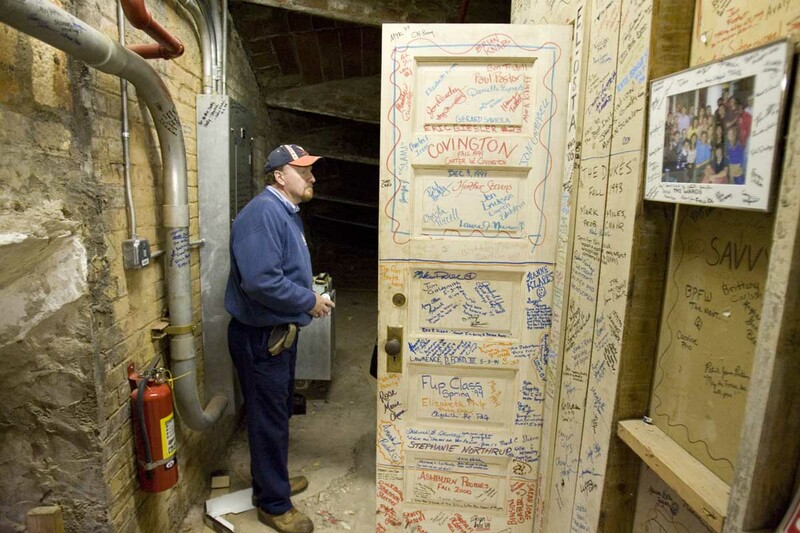 Many of the student signatures on the wall behind the clock will stay, too. The Rotunda’s cornice acts as a visual—and purely decorative—transition point between the brick drum of the building and the roof. Back in the 19th century, cornices were relatively inexpensive to fabricate and assemble, and the ornament could be bought by the linear foot, much like crown molding today. The cornice installed during the 1898 Stanford White renovation was made mostly of copper, with iron brackets and a few wooden elements, such as plugs and nailers. While the copper and iron pieces were in good shape and reusable for this renovation, the wood had decomposed. Crews disassembled the entire cornice in order to remove the accreted layers of paint from the copper and to make repairs to the other metal and wood parts. They installed new brackets, replicated and repaired cast iron hangers, replaced all of the wooden elements and devised a more modern system to fasten the brackets to the Rotunda wall. Since the copper was on a curve, each piece had to be numbered in sequence during disassembly so that they could be put back in order. Once the repairs were made, crews reattached the copper by tacking each piece on to its adjacent ones and returning each section of ornament to its original spot.